Operation Enduring Warrior (OEW) is a veteran-founded non-profit organization whose mission is to Honor, Empower and Motivate our nation’s wounded service members through a physical, mental and emotional rehabilitation. OEW’s programs’ help participants overcome adversity and hardship through innovation, teamwork and perseverance. This ultimately enables wounded veterans’ lives to go in directions they may have once thought were impossible. 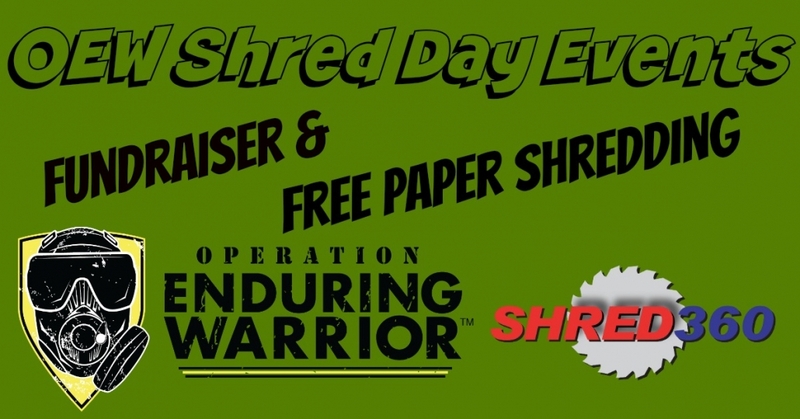 To contribute to OEW’s mission, Shred360 is holding a series of shred day events which will offer free document destruction to the public! Attendees are encouraged to make monetary donations, all of which will go to Operation Enduring Warrior. See the events below, and please share!